Hull resistance to kinetic damage increased by 27 pts. Archon destroyer was first used in a battle against Aliens in 4616, the Mendez family. The appearance of the prototype on the battlefield caused heated debate. The destroyer’s design was strongly reminiscent of the works by great master Arthur Liu, killed in the ‘Monolith’ crash.The surviving members of the Liu family accused Mendes of stealing. However, the Board of families awed by the destroyer’s tremendous power did not listen to them. 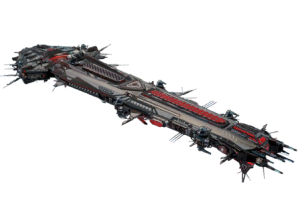 After the Mendes demarche and their exodus to quarantine sectors Archon became the basis of their fleet’s strike force. Reroutes energy flow in ship systems. Allows to select between max speed by 20%, weapon damage by 20% or restoring of 250 pts. shield volume per second. 120 en. 0,3 s.
Reroutes energy flow in ship systems. Allows to select between max speed by 20%, weapon damage by 12% or restoring of 400 pts. shield volume per second. 120 en. 0,3 s.
Reroutes energy flow in ship systems. Allows to select between max speed by 30%, weapon damage by 12% or restoring of 250 pts. shield volume per second. 120 en. 0,3 s.
EM spread reduced by 33%. Power of Suppressor Class modules increased by 10%. Cooldown time of Suppressor Class modules decreased by 15%. Energy drain of of Suppressor Class modules decreased by 25%. This page was last modified on 23 March 2019, at 15:13. This page has been accessed 13,933 times.